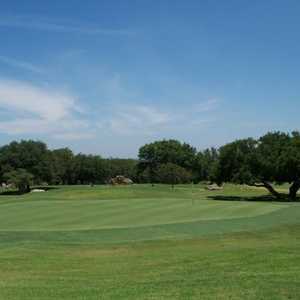 BLANCO, Texas -- Whether you're a San Antonio or Austin resident or live somewhere in between, put Vaaler Creek Golf Club on your radar. 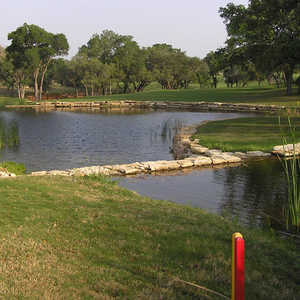 A long carry is required over water at Vaaler Creek Golf Club's finishing hole. Located inside the Rockin' J Ranch community deep in the heart of the Texas Hill Country, Vaaler Creek Golf Club is a Michael Lowry/J.R. Newman design that features breath-taking vistas of the rolling countryside and live oaks. Golfers who book tee times at Vaaler Creek G.C. can expect beautiful water features and expertly placed bunkers. One of the newest in the Texas Hill Country, Vaaler Creek is just a few minutes from the old town center of Blanco in the new Rockin' J Ranch development, an 1,100-acre parcel of 1,800 home sites to go along with 18 holes of golf. The winding drive from Austin to Blanco past scenic ranch lands creeps a sneaky 500 feet higher, which helps make summertime temperatures a little more comfortable. Vaaler Creek also utilizes the Trinity Aquifer and not the more restricted Edwards Aquifer. So between the higher altitude and with more water at its disposal, you can expect better-than-average conditions when central Texas weather is at its most extreme. The course was built by Mike Lowry and J.R. Newman and is named after Jack Vaaler, a war veteran who served with Rockin' J's owner, Colonel Lee Roper. The course's two nines are routed into a large figure eight and were built at different times. Construction of the back began in 2005 and opened in 2007, which is when construction on the front started. The front was completed in 2009. The most noticeable of several differences between the front and back are on the greens. Greens are far more undulating on the front, with some opportunities for the greenskeeper to set some seriously devilish pin locations atop small tiers and shelves toward the backs of the green. The ninth, for example, has the most severe of slopes that separates a small back tier from a large, lower front surface. That can turn this 163-yard shot from a potential tap-in birdie during corporate outings to a real beast when hosting low-handicap events. "I think the average golfer enjoys the course because it looks more difficult than it is," said Adam Grosch, the director of golf at Vaaler Creek. Grosch has first-hand knowledge of how the course was conceived, as the architects watched him hit balls from proposed back tees and determined where to build bunkers based on where they landed. That means shorter hitters probably can't reach the trouble as easily as PGA-level pros, making for wider landing zones. There is even a split-fairway hole -- the par-5 10th -- that makes golfers choose between an upper and lower tier guarded in the middle by thick grass. At 6,864 yards from the championship tees and 6,299 yards from the middle-back set, driver shouldn't be needed off every tee box, especially the two finishing holes. Both of those holes, however, require forced carries on the approach. The 17th is framed with trees and requires a shot over water to a shady, long green surrounded by trees. The 18th is a severe dogleg left to a fairway that slopes down toward a large pond that must be carried on the approach. 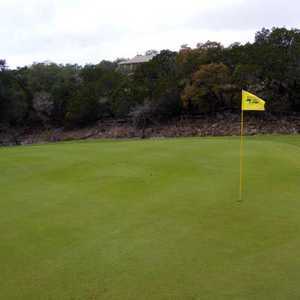 Located in the heart of the Texas Hill Country, Vaaler Creek isn't the closest course to San Antonio or Austin. But those who want a pleasant escape from either city will enjoy a day at Vaaler Creek, which has a pleasant blend of hole variety and playability. And because the accompanying residential component is still in its infancy, few courses are more peaceful. Facilities here include a full driving range and short-game area. The clubhouse is a small, renovated ranch house from the 1860s, but there is plenty of room on a 5,500-square-foot shaded deck that overlooks the 18th hole and pond. For those looking to stay and play at Vaaler Creek, two- and three-bedroom condominium units are also located on site. Or, if you live nearby, inquire about a membership or season-pass options.